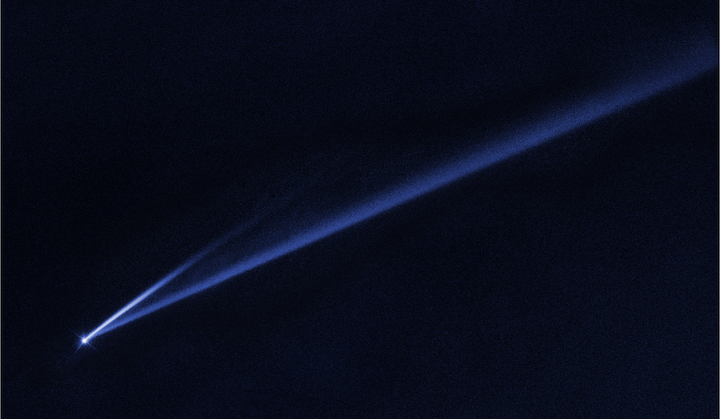 This Hubble Space Telescope image reveals the gradual self-destruction of an asteroid, whose ejected dusty material has formed two long, thin, comet-like tails. The longer tail stretches more than 500,000 miles (800,000 kilometers) and is roughly 3,000 miles (4,800 kilometers) wide. The shorter tail is about a quarter as long. The streamers will eventually disperse into space. A small asteroid has been caught in the process of spinning so fast it’s throwing off material, according to new data from NASA’s Hubble Space Telescope and other observatories. Discovered in 1988, the 2.5-mile-wide (4-kilometer-wide) asteroid has been observed repeatedly, but the debris tails are the first evidence of disintegration. Gault is located 214 million miles (344 million kilometers) from the Sun. Of the roughly 800,000 known asteroids between Mars and Jupiter, astronomers estimate that this type of event in the asteroid belt is rare, occurring roughly once a year. Gault is only the second asteroid whose disintegration has been strongly linked to a process known as a YORP effect. (YORP stands for “Yarkovsky–O'Keefe–Radzievskii–Paddack,” the names of four scientists who contributed to the concept.) When sunlight heats an asteroid, infrared radiation escaping from its warmed surface carries off angular momentum as well as heat. This process creates a tiny torque that can cause the asteroid to continually spin faster. When the resulting centrifugal force starts to overcome gravity, the asteroid’s surface becomes unstable, and landslides may send dust and rubble drifting into space at a couple miles per hour, or the speed of a strolling human. The researchers estimate that Gault could have been slowly spinning up for more than 100 million years. Piecing together Gault’s recent activity is an astronomical forensics investigation involving telescopes and astronomers around the world. All-sky surveys, ground-based telescopes, and space-based facilities like the Hubble Space Telescope pooled their efforts to make this discovery possible. The initial clue was the fortuitous detection of the first debris tail, observed on Jan. 5, 2019, by the NASA-funded Asteroid Terrestrial-Impact Last Alert System (ATLAS) telescope in Hawaii. The tail also turned up in archival data from December 2018 from ATLAS and the Panoramic Survey Telescope and Rapid Response System (Pan-STARRS) telescopes in Hawaii. In mid-January, a second shorter tail was spied by the Canada–France–Hawaii Telescope in Hawaii and the Isaac Newton Telescope in Spain, as well as by other observers. An analysis of both tails suggests the two dust events occurred around Oct. 28 and Dec. 30, 2018.